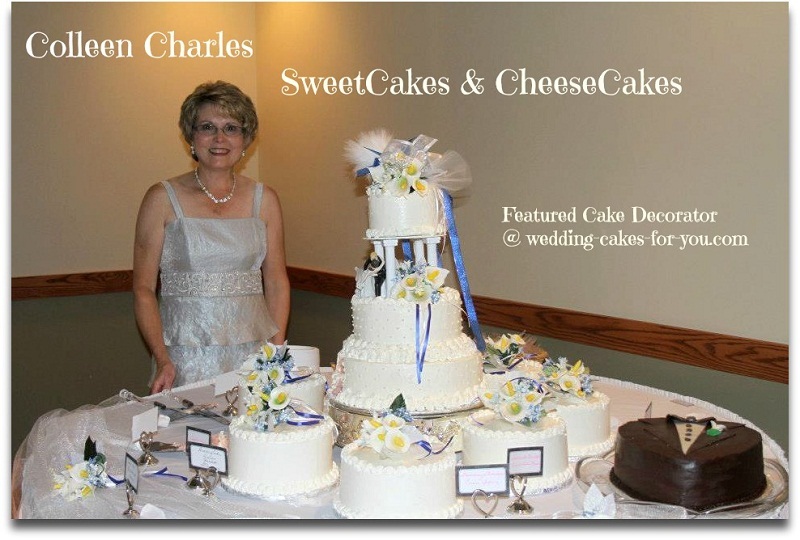 The Cake Decorating With Series....features owner and operator of SweetCakes & CheeseCakes Colleen Charles. Colleen's love for baking and decorating started early on with the influence of her grandmother and good old Betty Crocker. When did you start thinking about baking and cake decorating? 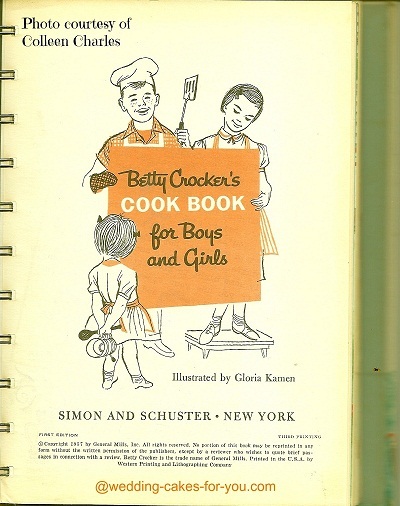 Colleen-My first baking book was Betty Crocker’'s Cookbook for Boys and Girls that I received when I was 8. It had a beautiful picture of an Easter Hat cake, along with several others, and I thought how much my mother would love it – and she did; that was my first attempt. Simple but pure. 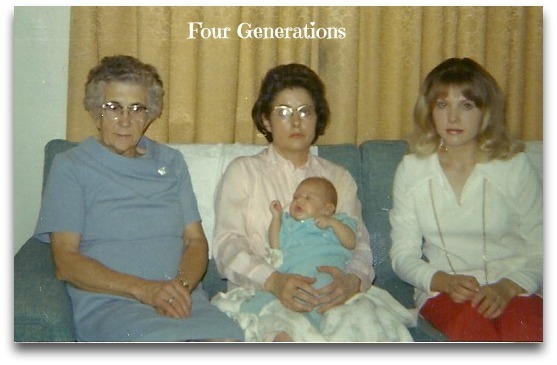 My grandmother (my mom’s mother) lived with us for quite a few years and was my biggest influence. She raised 15 children, so she was always making some kind of baked goods on their farm for the family and farm hands. We always had pies, cookies and cakes; always in LARGE batches. I would ask my neighbor, Phyllis, for help too. There was a recipe for Brown Sugar Fudge cake and frosting on the back of the Swan’s Down cake box that I made a lot (my dad loved it). You had to boil syrup for the frosting I remember, and didn’t know what it meant. So I stopped in the middle of it, ran across the street and asked Phyllis, she explained it, gave me a thermometer to use, and I ran back home and finished it. I baked constantly for my kids; every Monday I would make a pie or cake and always cookies. 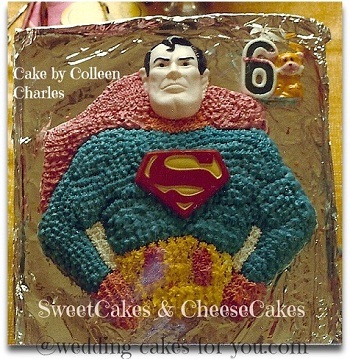 The first really decorated caked I made was a Superman cake (Wilton cake pan)for my son’s 6th birthday. That was my first piping experience. It took FOREVER!! It was May and it was so warm that I had to finish it around 6am so it wouldn’t melt. A classic Wilton cake for the beginner. Now they complain: how come you didn’t decorate our cakes like you do now??? REallly? How about I was busy with everything else...and you didn’t give it a chance to cool off. Do you have a background in arts and crafts? 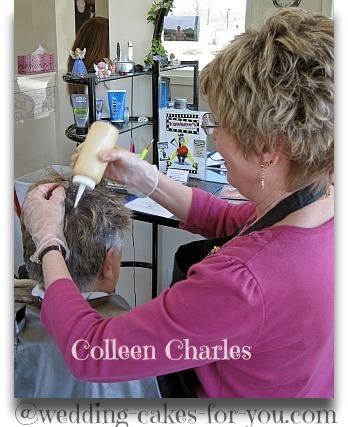 Colleen-Not really in arts and crafts, but I have been a hairdresser for 43 years and I think that helps me with the visuals and the detail work. Looking in the mirror for all of these years and watching people’s faces, I know what they want when they say, ‘you know…something like this one’. I have gardened all of my life too, so I see beauty wherever I look. When people look at a hairstyle in a magazine and they say ‘I want, not I want my hair, but I want to look like that, I know what they mean. I can’t give them the exact look, but do my interpretation of the picture. I can’t duplicate someone else s work EXACTLY. So when they show me a picture of a cake, I give them my interpretation. I explain it to them and tell them I will do the absolute best that I can to make it ‘especially for you’. It means a lot to them to be honest and they always say ‘oh I know it will be beautiful’. If there was a cake (or hair style) that I felt I absolutely could not replicate, I have no problem telling them that. I refuse to let my pride loose a customer; honesty is always best. Most people understand; only 1 time in 43 years have I told a hair client I would absolutely not compromise my work and do what she wanted and she left. I would do the same for a cake. We all have limits to our abilities and we are foolish to try to be what we are not or create what is beyond us. Sometimes the stress is just not worth it. You accomplish nothing; you only get discouraged when it’s not working and it makes you want to give it all up. 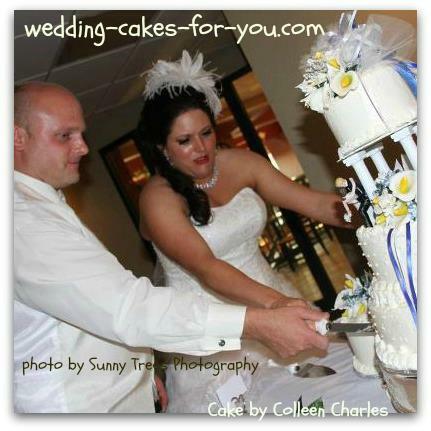 You seem to really enjoy helping other cake decorators when they get stuck or have questions. Do you think you may want to teach others down the road? Colleen-I try to answer questions that I have ‘been there, done that’, I know how frustrating it can be when you have read and reread the directions, mixed and measured and it’s a flop. Bummer. I have shed my portion of tears, said a few swear words, thrown a few fits, screamed a little, and still go back for more. I will redo a recipe until it works; but I do know when to quit too. Sometimes it just doesn’t work _ period. Maybe it’s you; maybe it’s the recipe, maybe who the heck knows. 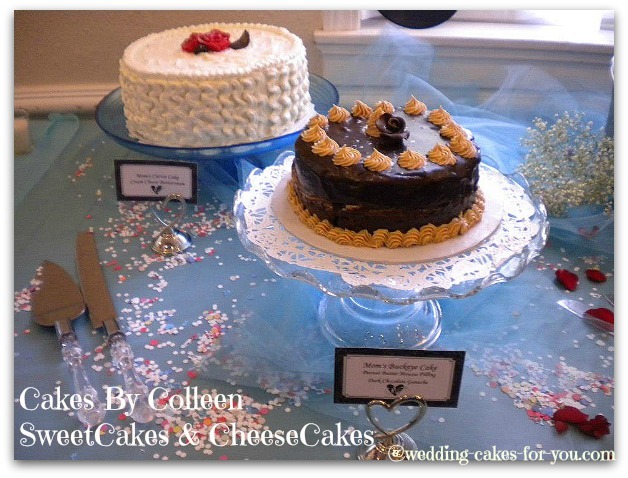 I do know that Wedding Cakes For You is the best thing that every happened to me for baking. I have learned so much from this site and Lorelie is an Angel and is the epitome of a teacher that unfortunately you never really get to see. Every question is answered and you can tell it is done with love. 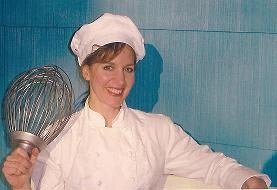 Her pleasure of her baking career comes through loud and clear when being guided through her site. I only hope that I can return the favor to others by answering their questions and easing their minds (or what’s left of it after baking all day). What is the most requested flavor from your customers? Colleen-My most requested flavor is the Lorelie's Buttermilk Chocolate Cake , Chocolate Stout Cake (Lorelie’s) with Dark Chocolate Ganache, Peanut Butter Cake with Peanut Butter Mousse, Lemon Cake with Raspberry filling, my Carrot Cake with Cream Cheese ButterCream, Strawberry Berry Cake with Strawberry Mousseline and Chunky Coconut with Coconut Cream filling. I use Italian Meringue Buttercream for almost all of my cakes.I love the silky smoothness of it and you can do so much with it. People have not lived until they have tasted IMBC! Everything that I make is made from scratch; all of my decorations are hand crafted, custom made. Modeling chocolate and Fondex are used for my decorations. People like the fact that everything is edible; getting their money’s worth! I do like working with Gumpaste for flowers and the more I do, the better I get. That’s the attitude that counts. Not everything you make will always look like the picture example. Just do the best that you can, and the client will love it. You sell yourself and your product with your attitude. Remember, it’s the effort that shows through. It doesn’t matter if it’s a $40 cake or a $400 cake; it’s what’s inside of you that will show through. What cake is your most meaningful ? 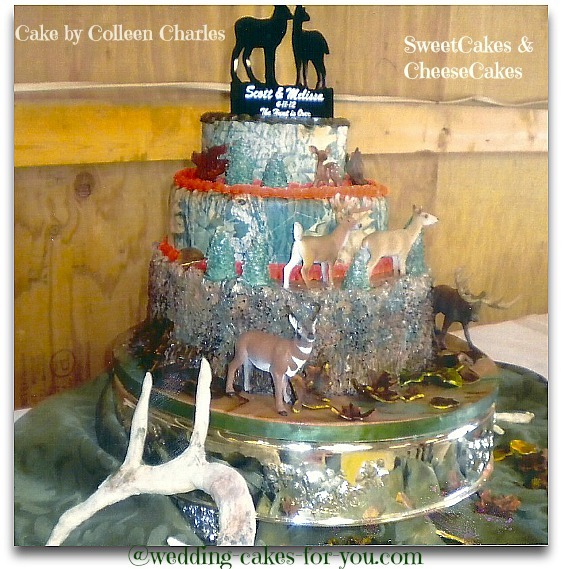 Click the picture to see this cake entry in the wedding cake contest. My daughter, Andrea’s wedding cakes. Talk about stressed out!!! It was a challenge all of the way. I had never made Gumpaste lilies, and made 13 separate bouquets for all of the decorations. Talk about trial and error.. I would get them done, set them aside, go to Michael’s for something and see another doodad to put on them. I had never made a Tuxedo cake but had seen one on the Wilton website and it took me a couple tries to make the shirt and tie on it, buy hey, practice makes perfect. I learn with each cake what doesn’t work and what will make life easier next time. Andrea and I made the girl’s bouquets too so it was just such a loving experience all around. What was your craziest cake decorating request? I made the antlers by copying some that one of my friends lent me. Took me 3 tries before I figured out how to dry them and not have them break when I picked them up. Ordered figurines off of EBay; deer are not a popular item in April. I went to Michaels and ask them if they still had any Christmas figurines left of deer. The look said it all……. Then when I finished the bottom stump to look like a tree and had it all multi colored and combed and sprinkled, I thought wow! I did it! My husband walk by and said “how come it’s so round”. My look said it all and he’s never really ventured another comment. The clients were thrilled with it and I chalked up another ‘experience in the cake world’. 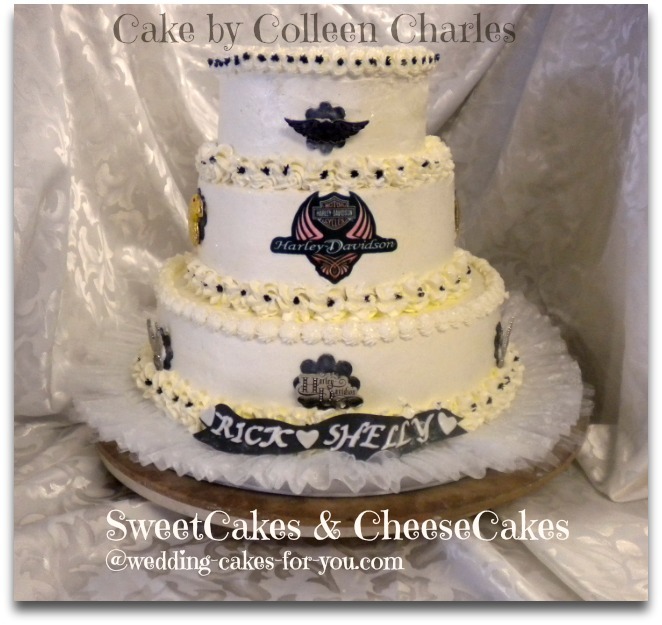 Of course then there was the Harley Davidson cake. That’s another story! Colleen-I used to love to sew and crochet. Won quite a few blue ribbons at the fairs. I gardened and canned and I still have huge flower beds. I remember how much I enjoyed going to the basement and looking at all of the jars of fruits, vegetables and jellies and thinking how beautiful they all looked. 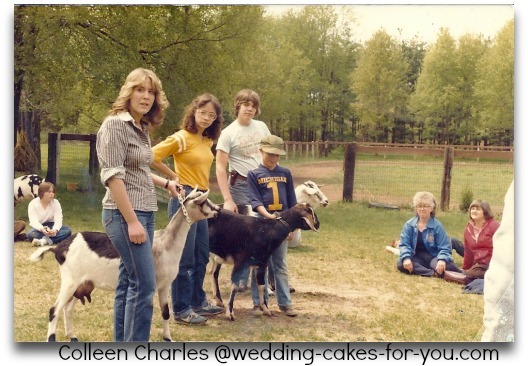 My kids were in 4h with horses, goats, turkeys and rabbits and I was a co-leader with everything. Somehow I was always to ‘go to’ person at the fair when someone’s horse or goat needed to be groomed. They knew I always had scissors and clippers on me! I’m still the ‘what do I do person’ at work. I was a Cub Scout, Brownie and Girl Scout leader for 10 yrs and loved the creative part of working on badges. My troops started the annual craft fair at Our Lady of Fatima and we planted flowers all around the grounds. We had so much fun with the baking and cooking badges. I can say that my girls learned how to cut up a chicken properly and set a beautiful table (that’s how I learned). Did you ever take cake decorating classes? 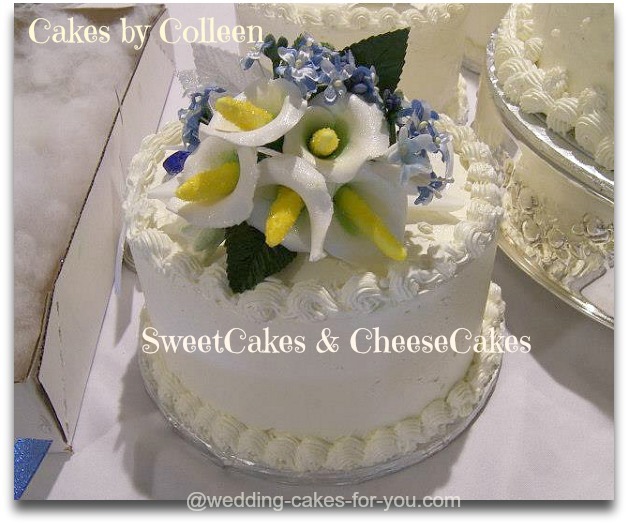 Colleen-I finally took some Wilton classes at Michael's about 7 yrs ago. My husband encouraged me to. Anything to do with cake he was all for it ! Little did I know that once they hooked you, you are their coupon slave! At one time I was cleaning out the basement and admiring how much room I had. Now I have 6 tubs of cake pans, drawers full of CAKE STUFF, bins for flour and sugar and shelves of beautiful cake plates. I never had time with the kids, my work and everything else. My beauty shop was next to my house for 13 years so I was always busy in the shop, the house or the yard. My Wilton teacher had been baking for over 50 years and was a lovely lady. She had me come over to her house to help me with my roses. 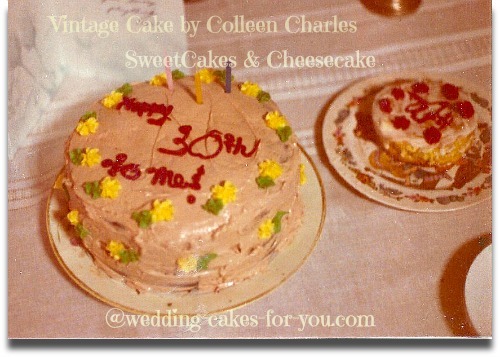 She had so many albums of cakes that were just gorgeous; all the fancy Wilton piping, bridges, tiers….I was amazed at her talent and only dreamed that I could be ½ as good. She encouraged me quite a bit, but I do remember she told me that I would never make any money at this because I liked to baked from scratch. Oh well…..it’s a challenge, but well worth it to see the smiles and the looks on their faces. The one you make when you bite into something that makes you happy like a Godiva chocolate. Cake bloopers you would like to talk about? 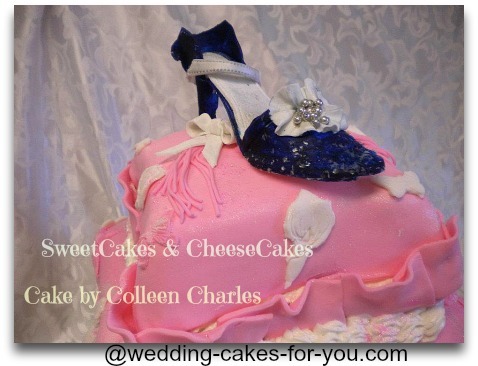 Colleen-I found a picture of this beautiful pillow cake that I wanted to make for my daughter’s wedding shower. I bought the Wilton pan set and tried 3 times to make the 3 tiers. I never could get the large pan to bake up right. It would burn around the edges and not cook in the middle. I swore I would never use it again. I even wrote Wilton and told them what a crappy pan it was. I’ll never use it again; some times you just need to move on. I’m putting it together at 10pm the night before and rolled the pink fondant too short for the top pillow…..didn’t really care at that point. Got it all stacked and it still looked crooked. I went to bed and prayed. At least the shoes turned out perfect! 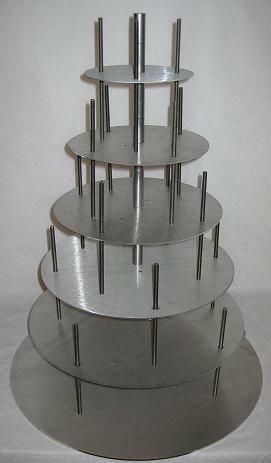 I had sent for a Cake Stackers system and it came that day but was too busy to get it out and use it. I knew it would take some time to watch the video and so I stacked and doweled it the way that I had always done and was extremely confident that it was okay. Put it a large box, covered it, put it on the front seat, leveled it and took off for the party. Carried it in the house, took off the top of the box and it had all slid forward, smashed – but the shoe was still in place lol. Well the tears, hysterical ones, started to flow and my daughters and granddaughter thought that granny had lost it and they actually laughed. They kept telling me it was okay, no one would notice, just cut it ahead of time. Needless to say, no one really did notice (unless someone pointed it out), it tasted fantastic, and I learned a huge lesson. USE CAKE STACKERS IF YOU DON’T WANT TO LOOSE YOUR MIND DELIVERING A CAKE! What made you decide that this was something you wanted to do professionally? My son opened a restaurant in our town in 2006, and being the wonderful mother that I am, offered to ‘help him out’ with a few desserts so he wouldn’t have to buy them. He said he couldn’t stand the thought of serving frozen stuff after eating mom’s all his life. So for 7 yrs. My name became: Mom’s Alternate Endings. 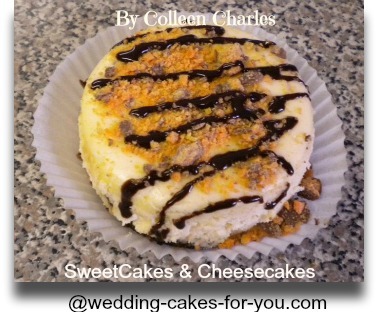 I changed it to SweetCakes & CheeseCakes last fall. I spent my 2 days off each week baking for him. I started doing orders for events there and people would ask me at my work if I could make something for them. I started taking pictures of my desserts and started albums. I look back at some of them and think, oh well they were a perfect test audience! No one ever complained if it wasn’t just perfect; they appreciated that it was made from scratch and you can’t get that in many restaurants. Perfection is a harsh word for any endeavor; we are human and are not meant to be perfect nor is our work, hard as we try. He closed almost 2 years ago but my business is growing bigger and I’m getting better! I really enjoy baking and challenging myself constantly. 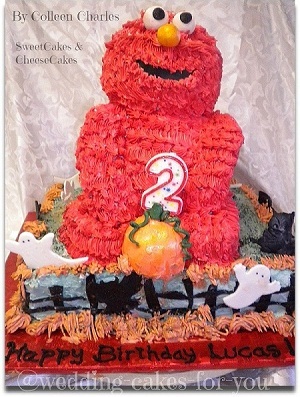 When I see the cakes that I first decorated with basic Wilton lessons, and now look at the Elmo cake that I made for my grandson’s birthday on Halloween and my daughter’s wedding cakes……I’ve come a long way! Lol They may not be perfect, but you cannot imagine how much love that is put in to each one that I make. I don’t do it for myself totally; I do it to see the pleasure of others. Do you have business questions? You can ask them right here on this website. Get answers fast!